There are few elixirs that equal mature Sauternes or Barsac. 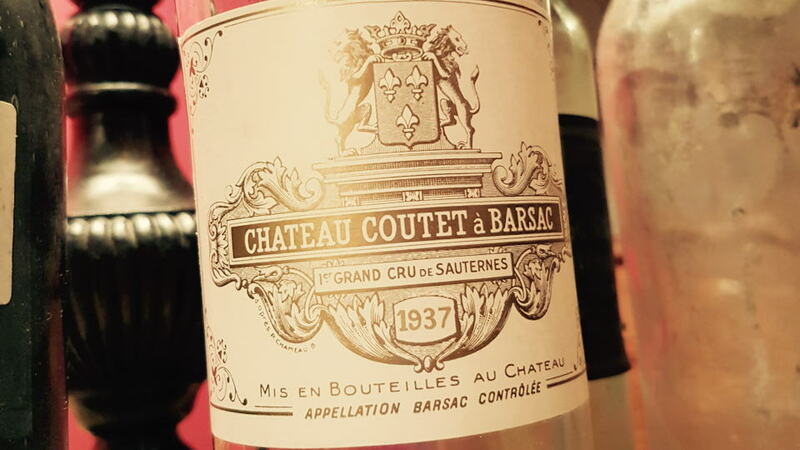 The 1937 Château Coutet made a huge impression when it completed a bibulous dinner in Bordeaux. Coutet is renowned for its often razor-sharp acidity that differentiates it from Climens or Doisy-Védrines. According to Clive Coates MW, Henri-Louis Guy, an industrialist from Lyon, bought the property in 1925. Guy made his money in hydraulic presses, and installed them at Coutet. Those vertical presses are apparently still used today. Guy passed away shortly after buying the estate, although I do not know the exact year. I suspect that by 1937 Guy’s daughter had taken over the running of the estate and it was she who inspired the Cuvée Madame that debuted in 1943. A majority of the vines were Sémillon, the remainder Sauvignon Blanc, although the exact blend is lost in the sands of time. The present owners, the Baly family, acquired Coutet in 1977. The 1937 Coutet has a lucid amber color. The bouquet springs out of the glass with gorgeous notes of honey, overripe apricots, blood orange and a touch of adhesive, a tincture often found on old Barsac wines. The palate is viscous on the entry, and after so many decades continues to exhibit the concentration that the 1937 vintage bestowed. That is counterbalanced by the acidity that keeps this Coutet beautifully balanced and complements that mandarin, orange zest, toffee and almond notes fanning out gloriously on the finish. If you want to quibble, perhaps the 1937 does not exude refinement, and yet the weight and persistence on the finish elicits so much enjoyment that I don’t really care all that much. The 1937 Coutet appears to be going strong. I would not be surprised if it reaches a century old and tastes the same as it does today! 95/Drink 2018-2037.